Gallstones and Kidney Transplantation; Prophylactic Or Expectant Laparoscopic Cholecystectomy? Hani H Haider, MD, Hatem Matar, MD, Ali Taqi, MD, Husain Hayati, MD, Adnan Sadeq, MD, Mustafa Almosawi, MD. Hamed Al-Essa Organ Transplant Center, Kuwait. Purpose of study: Laparoscopic cholecystectomy (LC) is a relatively safe procedure in the modern era. Whether there is advantage in performing this surgery prophylactically in asymptomatic kidney transplant recipients is still controversial. 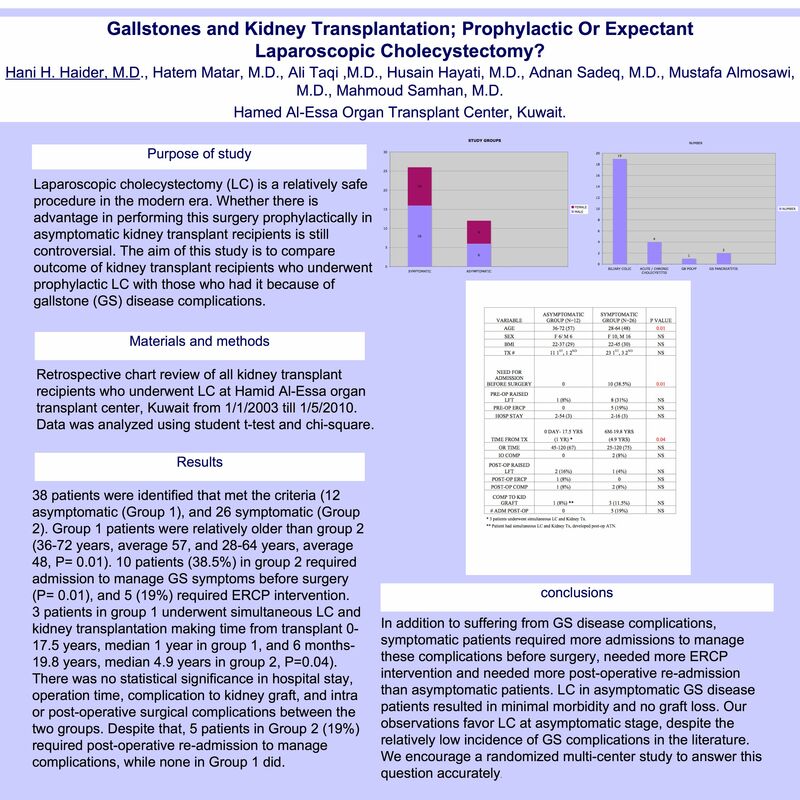 The aim of this study is to compare outcome of kidney transplant recipients who underwent prophylactic LC with those who had it because of gallstone (GS) disease complications. Materials and methods: Retrospective chart review of all kidney transplant recipients who underwent LC at Hamid Al-Essa organ transplant center, Kuwait from 1/1/2003 till 1/5/2010. Data was analyzed using student t-test and chi-square. Results: 38 patients were identified that met the criteria (12 asymptomatic (Group 1), and 26 symptomatic (Group 2). Group 1 patients were relatively older than group 2 (36-72 years, average 57, and 28-64 years, average 48, P= 0.01). 10 patients (38.5%) in group 2 required admission to manage GS symptoms before surgery (P= 0.01), and 5 (19%) required ERCP intervention. 3 patients in group 1 underwent simultaneous LC and kidney transplantation making time from transplant 0-17.5 years, median 1 year in group 1, and 6 months-19.8 years, median 4.9 years in group 2, P=0.04). There was no statistical significance in hospital stay, operation time, complication to kidney graft, and intra or post-operative surgical complications between the two groups. Despite that, 5 patients in Group 2 (19%) required post-operative re-admission to manage complications, while none in Group 1 did. Conclusions: In addition to suffering from GS disease complications, symptomatic patients required more admissions to manage these complications before surgery, needed more ERCP intervention and needed more post-operative re-admission than asymptomatic patients. LC in asymptomatic GS disease patients resulted in minimal morbidity and no graft loss. Our observations favor LC at asymptomatic stage, despite the relatively low incidence of GS complications in the literature. We encourage a randomized multi-center study to answer this question accurately.